Personal defense situations aren’t planned. They happen without warning and are decided in a matter of seconds. Federal Premium handgun loads are the best around. We offer a full range of popular and effective loads to meet your specific personal defense needs. 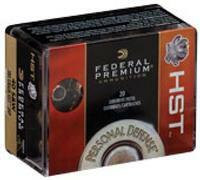 Under our Premium Personal Defense line, we offer bullet styles HST, Hydra-Shok, NyClad or JHP.